“Diabetes is the fastest growing debilitating disease in the world”. In 2015, statistics showed that 415 million people suffer from diabetes worldwide. The rate is expected to increase by 54.5% and reach about 642 million people by 2040. The Middle Eastern population account for approximately 20% of these cases. According to the International Diabetes Federation (IDF), the United Arabian Emirates (UAE) has 745,940 diabetics, 304,000 undiagnosed diabetics, and 934,300 pre-diabetics.3 We corresponded with researchers Dr. Al-Anouti and Dr. Al-Safar from Zayed University and Khalifa University to discuss their research on vitamin D receptor gene polymorphisms among Emirati patients with type 2 diabetes mellitus. Figure 1. 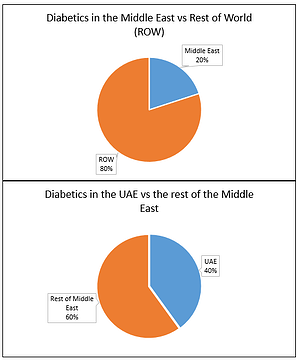 Diabetics in the Middle East and UAE comparison pie charts we created based on the IDF statistics from 2015. Please note that these percentages are approximations. What do they know so far? “Vitamin D is a neurohormone used by the body for many functions, like bone metabolism, immunity, nerve function, and now scientists believe it may also play a role in the function of the pancreas and insulin sensitivity, malfunction of which are linked to diabetes.” - Dr. Al-Anouti and Dr. Al-Safar. In Saudi Arabia, a recent study found that the VDR had genetic variants that were significantly associated with T2DM as well as cholesterol disorders that are often associated with T2DM. “Similar results have also been found in Caucasians of European descent, but explorations in India, believe that the genetic VDR-T2DM link may only appear in certain population groups.” Dr. Al Anouti and Dr. Al Safar. After accumulating enough evidence of a possible link, Dr. Al Safar and Dr. Al Anouti decided to collaborate on their research. This is the first study that specifically looks at the UAE population. The project’s Emirati volunteers were a mix of diabetic individuals and healthy individuals, where their DNA was extracted from saliva that was collected using Oragene·DNA. ““All participants were comfortable using the kit. To them, it was much more convenient than collecting blood. And, the DNA yield was very adequate for our use.” - Dr. Al Anouti and Dr. Al-Safar. Three VDR single-nucleotide polymorphisms (SNPs) were genotyped, and the relationship between the VDR SNPs polymorphisms and the demographic data were analyzed. A link between specific VDR SNPs and T2DM in the Emirati population was found, SNP rs2228570. Genetic ethnicity variations could be the key to understand the spread of diseases among a particular race compared to another. “[Our] next goal for this research is to perform validation studies in other ethnic groups and to expand the cohort size to confirm the project’s findings. The goal is to confirm the identified genes, so they can be added to diagnostic biomarkers that could be utilized in clinics to improve screening and personalized treatment of T2DM patients.” – Dr. Al-Anouti and Dr. Al-Safar. Dr. Al-Anouti and Dr. Al-Safar were also featured in our International Women’s Day blog earlier this month. International Diabetes Federation. World Diabetes Day., (19 November 2015) from http://www.idf.org/wdd-index/. Al Safar H et al. Vitamin D receptor gene polymorphisms among Emirati patients with type 2 diabetes mellitus. J steroid biochemistry & molecular biology. 175:119-124 (2018). Bardsley D. Emirati gene linked to diabetes, research reveals. The National. Web. (2018). Al-Daghri, NM et al. Vitamin D receptor gene polymorphisms and HLA DRB1* 04 co-segregation in Saudi type 2 diabetes patients. J. Immunol. 188:1325-1332 (2012).